The Temple of the Golden One is a monotheistic faith devoted to Hep’a’nen which teaches that while Hep’a’nen is not the only god-like being, He is the only one who is Good and worthy of worship. The worship of Hep’a’nen is the most common belief system in Sha’uru, with an estimated 89% of all sentient denizens following Him in some form. Hep’a’nen goes by many names, depending on where in Sha’Uru an individual finds themselves. To Humans, He is oft called The Allfather, The Holy One, and The Herald of the Sun. He is typically depicted as a conventionally handsome, middle-aged man with black hair and a short beard. The Caregiver - Hep'a'nen is usually portrayed with his hand gently on another's shoulder, his sword sheathed and at his side. The Hunter - Hep'a'nen is shown charging toward or in combat with enemies; his sword is unsheathed and held high in a gesture of attack. The Shepherd - In this portrayal, Hep'a'nen again has high sword unsheathed and held aloft, but it is as a guiding light, typically surrounded by his followers. Common symbology related to Hep’a’nen: candle flame/lantern flame, stars/sea stars (predominantly amongst Vand Nisse), and the sun. 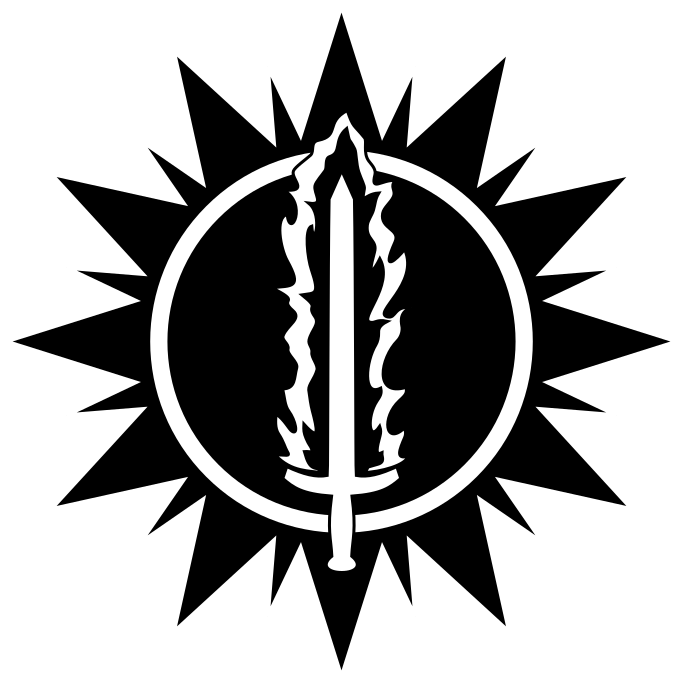 Officially, His is the symbol of the flaming sword within a sun. Many Durren homes keep a single candle or lantern burning through the night as a symbol to His grace. Many Vand Nisse vessels will have a small altar dedicated to Hep’a’nen on board, and tiny seaside shrines can be found on islands and the shorelines across Sha’Uru. Hep’a’nen is not believed to be the creator of the world, he found the world of Sha'uru in his journeys and saw it had been befouled by the influence of his old enemy, Rum'at Abi, The Mother of Horrors. The scripture for those that worship Hep’a’nen is called The Word. Mystery and debate shrouds the document, despite the near universal agreement amongst his followers that it is His scripture, of how the document came to be. Some believe it was penned in ages past by those who could speak directly with Him, and they communicated with him of their free will. Some believe he possessed an individual and compelled them to write the book. Still others believe it was a collection of stories that had survived many generations through word-of-mouth put together by scholars who were not necessarily worshippers themselves. Humans, Dur, and Nisse all believe that Hep’a’nen came to save them from the scourge of Orcs, Dragons, and Trolls, the creations of Rum’At Abi. Hep’a’nens primary goal, and the goal of His most ardent followers is preventing the spread of Rum’ati agenda and conversion or elimination of Her followers. Hep’a’nen also teaches that this must be done through wisdom, for the destruction of evil can never come at the cost of one’s goodness. His followers believe that She is trying to spread corruption, lies and darkness to all of Sha’Uru, twisting into something more pleasing to her. However, Hep'a'nen is also a prideful god, and wishes for all creatures to worship only Him, as he believes his way is the only right and true way. Followers of Hep’a’nen believe there is an afterlife for those who worship Him. It is generally believed to be a different plane of existence than what Sha’Uru and the living are located on. Worshippers are thought to live there for eternity, though there is no universal stance on what that existence is like. Those who do not worship Hep’a’nen but also do not worship Rum’At Abi are thought to become ghosts and other aetheric beings, though these beings are not Just comprised of non-worshippers. Worshippers of Rum’At Abi who are struck down by Hep’a’nen or His believers are thought to go to a dark place after death. Some who follow His Word acknowledge or celebrate Forging Day. This occurs on January 12th. It is believed that on his 12th day overseeing Sha'Uru, Hep’a’nen forged the flaming sword he is known for after realizing that some of Rum’At’s creatures are susceptible to flame. It is a celebration of ingenuity and the value of hard work. This is not a major holiday to followers of Hep’a’nen nor the world at large, though it is more common for Durish households to recognize the holiday. There are some sects that engage in public worship, on varying days of the week. The most common form of service is a 30 minute gathering that opens with the lighting of 5 candles in the form of a diamond with one at the center. The middle is lit first and then it is used to light the remaining 4 in a clockwise order. Hep’a’nen’s Chant is spoken as this is done, and again at the end when the service is ended (the 4 outer candles are blown out in counter-clockwise order, then the middle). The bulk of the service involves reading from His Word and open discussion. In some cases, the discussion may be led by a particularly devout member, sometimes the people involved take turns, and other times there is no lead. There are legends of old of Hep’a’nen teaching his followers special rites and prayers to help them fight the darkness. These rites are said to only work correctly if performed by the worthy and truly devout, and can lessen or purge the influence of evil in people, places, and things.